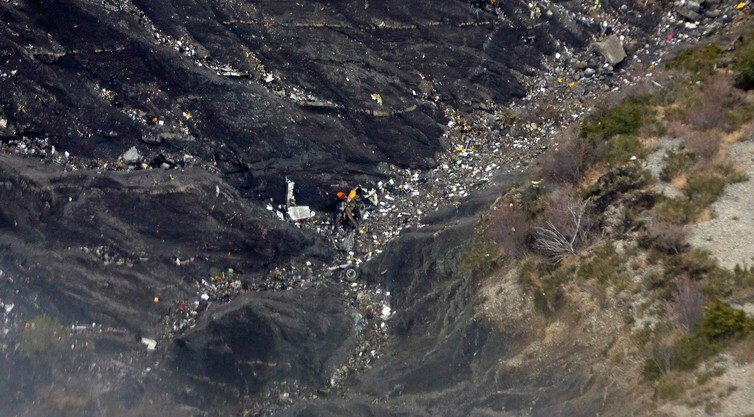 The investigation into the crash of Germanwings Flight 4U9525 has begun, and with it the process of locating and recovering the 150 victims, including two Australians. Answers will come later, once the blackbox data are analysed and the dual aspects of the recovery –- the aircraft and the victims -– are complete. The crash site will be treated as a crime scene, even if the crash was an accident. Criminal charges may follow for negligence at a later stage, for example. But full evidential recovery will take time, as the scene is remote and dangerous. It’s early spring in Europe, nights are cold and days short, add to this the fact that the plane crashed into the side of a mountain –- treacherous terrain even in the best of conditions. The time available each day for evidence and body recovery will be cut short by the environmental conditions. As a consequence, the crash site is going to pose challenges for the recovery and identification of the victims. But some aspects of the crash site will actually facilitate victim identification: the cold will slow decomposition, and the remoteness and altitude of the location means there will be less scavenger activity. Both factors will reduce the amount of important identification information being lost, such as fingerprints. These conditions also mean that the recovery teams don’t have to rush to protect the remains (except from further inclement weather such as snow storms). This could help the crash investigators as the more information that can be collected from the scene before anything is touched or moved, the better chance they have of figuring out exactly what happened. The positions and fragmentation of the victims will help them piece together the last minutes before the plane crashed. The debris field from a plane that exploded and disintegrated in the air presents very differently from a plane that crashed into the ground at speed but intact. Perhaps most significantly, the authorities have a very good idea of exactly who was on board, providing what is known as “presumptive identities” for the victims. A confirmed list of passengers and crew on board allows authorities to collect the ante-mortem information (dental charts, DNA samples and fingerprints from homes and places of work) in preparation for matching against the post-mortem information obtained from the victims once they are recovered. Facial recognition is never a suitable method for identifying victims. Instead the international disaster victim identification teams gathering to perform examinations of the victims will focus on characteristics known to provide reliable information, which is DNA, fingerprints and dental matches. Mass disaster planning is now a very advanced process, with guides available providing information on best practice. These guides have been primarily developed to manage scenes and investigative processes following transport incidents and terrorist attacks. So emergency plans will be kicking in, preparing to manage this situation to exacting standards. Consequently, although the conditions are incredibly difficult, unlike with the Malaysia Airlines Flight MH17 incident, all victims will be returned to their families. This process will be performed according to Interpol standards, as repatriating the victims with dignity and respect will be uppermost in the minds of those tasked with identifying them. Also of topmost importance is getting those identifications right. In the past, victims of mass fatality incidents have been misidentified. Recently, this included children who died in the South Korean ferry disaster and whose bodies were returned to the wrong families. Misidentifications also occurred following the Indian Ocean tsunami in 2004, when the Australian Federal Police expressed fears that Australians and other nationals were being misidentified and cremated as Thais. The tsunami disaster went far beyond the scope of any mass fatality plan at the time, with the number of deceased numbering more than 200,000. This event was unprecedented, and lessons were certainly learnt about contingency planning for the worst possible scenarios. It was an incredibly complex, multinational effort and experts from 39 countries were involved in the identification process; thousands of victims were identified and repatriated. But, more than 10 years on, the bodies of 369 victims remain unidentified. Thai police hold little hope that they will ever be returned to their loved ones. They will remain nameless forever. The correct management of the victims of mass fatality incidents, such as the loss of Flight 4U 9525, is not only important for the deceased, but is of paramount importance for the families and loved ones left behind to prevent further psychological trauma. The teams in place to carry out this difficult task will be acutely aware of the weight of responsibility on their shoulders. They need to get every identification right, regardless of how long that takes.